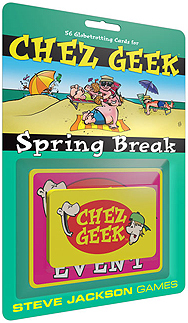 Take your quest for Slack on the road - it's time for Spring Break! In addition to 40 new cards that celebrate the ups and downs of travel, like Inexplicable Blizzard and Beach Nookie, you also get to change the rules with our brand-new, giant Event cards! This is an expansion for Chez Geek. It is not a stand-alone game.